Last week at the Sydney Retail Tech meet up Max Ryerson (@MaxRyerson) shared with the group some of his research and insights on the future of retail. Some of the big trends that he has observed in his global consulting practice are indicating that more and more of the purchases we make in store are ‘digitally influenced’ (think browsing, research or purchase). His figures showed that in Australia we see about 50% of store purchases influenced by digital, in the USA this is now up to 80% with the forecast that this will get to 100% in the next year or two. In one of his points, he called out the importance of click, collect and returns. 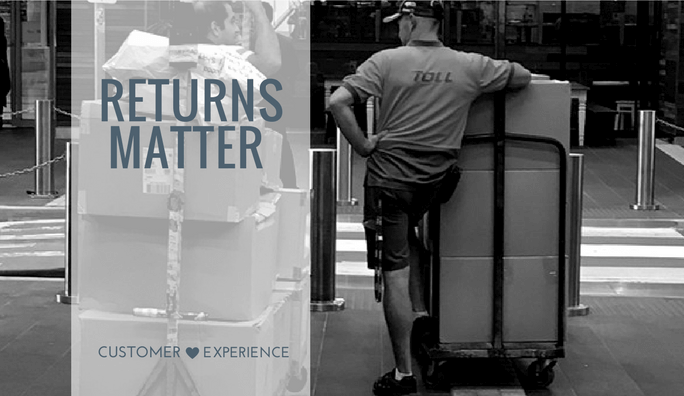 At 6R we’ve worked on a few click and collect projects and reviewed several returns processes, and we advocate that making the returns process easy for a customer is a win for any retailer. However, the small distinction of putting those three words running together in ONE thought /sentence was a shift. 30% of online purchases are returned. As the digital push grows and more and more of us make purchases from the comfort of our couch, desk or seat on the bus, the store will need to evolve to deal more with the myriad of reasons that merchandise is returned to stores; after all, 30% of online purchases are returned. One participant in the group shared that in her recent trip to Beijing after a couple of years away she was amazed to find that shopping space had shrunk dramatically and had been re-purposed for child care and restaurants. Most of the retail stores had become more like service points and were used mainly for collecting goods (ordered online) or returning them. In the US, we are seeing an increasing focus on the smoothing of returns process and the building of capacity to return and in some cases re-sell products through secondary networks. UPS this year estimated 5.8 million returns parcels in the first week of January, up from 5 million last year. The more we buy online, the more we will return. So, whilst I was having a moment of feeling like ‘we’re on the right track’ with the click and collect aspect of the projects I am working on. I did pause to reflect on how important the returns and exchange transaction is in digitally influenced shopping. So often, in retail, we focus on the experience of the sale. After all, it’s making the sales that keeps the whole thing turning, but getting the returns process right is an investment in a future sale. If online grows the way we are expecting it to, returning an item may well be the first and in some cases ONLY contact that the customer has with your brand and face to face retail team. If the experience doesn’t measure up, what then? In a market that is over supplied with choice, that’s easy. The customer will make a different choice next time. 95 % of customers will buy again if the returns process is easy. Make sure it’s on your website and easy to find and understand. 66% of shoppers READ your returns policy. I like the ‘step by step’ guide type format but whatever speaks to your audience is all good. Measure your returns. Some suggested measures for returns here [https://www.readycloud.com/articles/ecommerce-returns-statistics-key-facts-you-need-to-know]. Pick a couple of key measures and keep reviewing them; are you improving? Ensure that the reverse logistics are as clear and simple as possible. This is a lot easier to say than it is to do and it takes time to improve processes, train staff and improve. Consider incremental improvements; they are sometimes easier to handle than a sharp change in direction. Think creatively about how to make this into a win for the customer. Offering the customer an additional 10% for taking a store credit instead of a straight refund for returned goods (a la The Iconic) is one suggestion. They’re encouraging the customer to come back again, and not having to give the cash back, just the promise of a future 10% discount. Consider extending your returns policy. We are seeing several retailers extend the returns window to 100 days (The Iconic and The Athletes Foot). If this trend is cause for concern for your business, get in touch, we would love to work with you to make this a key selling point in your business.